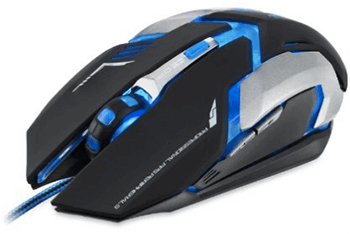 The Airfox GM001 ergonomic gaming mouse is an 800 to 3200 DPI programmable mouse and it has six (6) buttons. 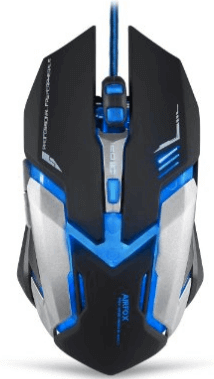 The Airfox GM001 is a cheap gaming mouse and totally awesome, not just from its looks and ergonomic structure, its features are high end and the colors by the way the LED lights look and the features it comes with, the colors are awesome, plus the strength of the mouse is great as well. There’s a great level at the ballpoint which is spot on. 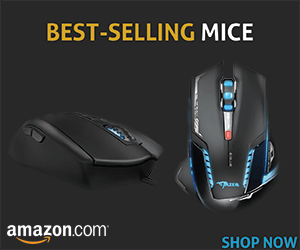 When I used this mouse to play games like COD Advanced Warfare, Far Cry 3 as well as Slinter Cell Conviction, I enjoyed the fast response and it really impressed me because I didn’t experience any lag of some sort, which is exactly what is needed when playing such games that require a very responsive mouse to play them. I believe Airfox made this possible because they incorporated a brand-new gaming chip that’s running on a 60MHz frequency together with 1ms USB report rate. This combination gives you powerful control in your game. This is an ergonomic mouse and the shape supports a firm claw grip, which looks like it might be too much, but it really isn’t (at least speaking from my own view because I have huge palms). My thumb fits in perfectly, hence, allowing me to use the right and left clicks for an elongated gameplay without experiencing click fatigue. This is actually a good sign because even though the grip might look too much, one tends to get used it. I also like the way Airfox made this mouse to be lightweight by default, even though they should have included some customizable weights that the user can later according to personal preferences. The Airfox GM001 comes with four adjustable DPI modes (800/1600/2500/3200). If you are wondering what surfaces, it will be working on, I used mine on my wooden home office table and on a leather surface as well with a moving speed of up to 60ips as well as a 20G acceleration which ensures that the mouse’s tracking is accurate enough on virtually any surface. 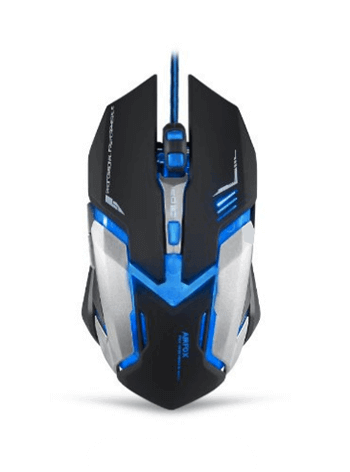 The Airfox gaming mouse has a professional optical gaming engine together with 6400 FPS image processing speed, a tracking speed of up to a thousand times per second USB polling rate. I also noticed that there’s no additional software needed to customize the behavior of this mouse which I might say has a downside because it reduces the level of customization but to some extent, increases simplicity in operation. In conclusion, I will say that the product is very good and I highly recommend it to those who are interested in playing games for an elongated period of time and yet, want to preserve the simplicity of operation. This are a smaller brother of the Auroza EMS639? I think yes, design same, but no have pulsing and variable color lights, and i think the sensor its not same (auroza got avago 3090). But if the all specifications and the sensor same, its a very cheap buy.